Easter, or the Resurrection of Christ, is one of the most celebrated Christian holidays in the world. Each country has its own way of celebrating Easter, through different customs and Romania too has its own wealth of traditions waiting to be discovered. For those who decided to spend Easter in Romania, let's take a glimpse into what Easter is for Romanians and how they celebrate it. In Romania, many Easter traditions have been preserved. The celebrations start with Holy Week, usually held a week later than Catholic Holy week. This is because the Orthodox Church calculates the date for Easter using the Julian, rather than the Gregorian calendar. Despite the different date, it also begins with Palm Sunday (in Romanian Florii), when Jesus entered Jerusalem and ends with Easter Sunday, when Christ was resurrected. Easter Sunday is celebrated on April 15 this year. During this week, final preparations are made for the big celebration. On Palm Sunday, people who attend mass in church return home with blessed willow branches and hang them on icons in the house. The Florii holiday is celebrated this year on April 8, when all those who have flower names and those called Florin or Florina celebrate their name day. On Good Thursday, also called Holy Thursday, people take food and drink to the church. On the same day, boiled eggs are painted. Tradition holds that if eggs turn red on Holy Thursday, they will keep without spoiling all year. The prominent color for Easter eggs is red, but other colors like yellow, green or blue are also used. In Romania, some more elaborate painted eggs are found, with different geometrical and floral motifs and many colors on the same egg (in opening picture). The egg painting ritual still survives, but only a few people still master the art of egg painting. The process involves various paints and wax. This type of painted egg makes a great gift for loved ones elsewhere in the world. 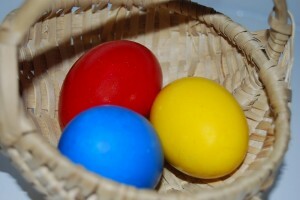 Most of the colored eggs on Easter can be eaten, as they are boiled. These special eggs however are emptied of their contents, leaving only a colored, light shell. 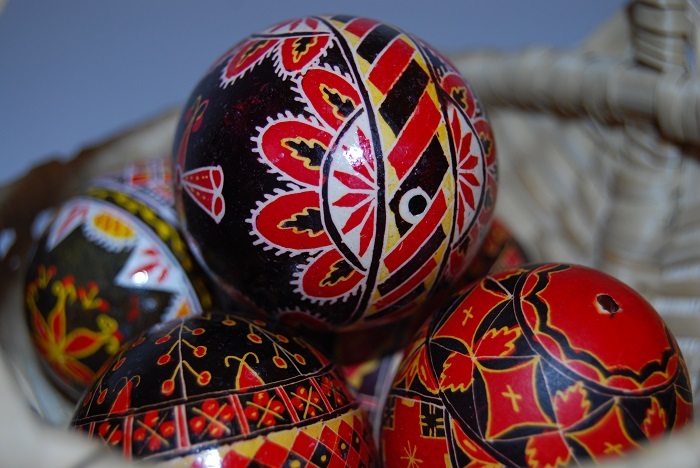 Most Romanians however paint eggs in red, green, blue and yellow for Easter, while the special painted eggs are to be found at fairs and in some regions of the country, for example in Northern Moldova. Another egg related tradition is tapping eggs on Easter day. Children usually have a competition to see whose egg has the thickest crust and can tap and break all the other eggs. This is usually done with normal, colored eggs that can be eaten afterward. The egg tapping game also involves a saying: the first person says 'Christ has resurrected' (in Romanian, 'Cristos a inviat'), while the second goes “True, he has resurrected" (in Romanian, 'Adevarat a inviat'). Good Friday is also called the Friday of Sufferings, because Jesus was crucified on this day. A tradition that has been kept in Romania is that of placing flowers at the church for Christ and passing under the table three times, signifying the pains Christ endured when he carried his cross to his crucifixion. On the night between Holy Saturday to Easter Sunday, people go to church to celebrate the Resurrection of Christ by attending the midnight mass, where they light candles. After that, they take the lighted candles home, bringing the' holy light' into their homes, souls and lives. On the Easter Sunday morning, people usually go to church for the Easter morning mass. This mass is however not as well attended as the midnight mass. After that, they go back home and eat the blessed food, which they had taken with them to the church. In Bucovina, on the night of Easter, there is a fire vigil custom. Fires are lit on the hills and burn all night. In Transylvania, young girls are sprayed with perfume by the boys dressed in traditional clothes on Easter Monday. This way, they say girls will have good luck all year. In Maramures, children go to friends and neighbors to announce the Resurrection of Christ. Anyone spending Easter with a Romanian family (or at a guest house that respects the holiday tradition), could see several special dishes on the table for the occasion. 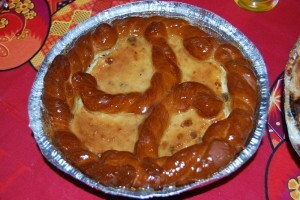 Don't miss 'Pasca', the traditional Romanian Easter cheese cake (in picture, right), sweet bread (cozonac), which is a slightly sweet yeast-raised egg bread, the lamb soup, lamb steak, haggis (drob) - which is a traditional national Easter dish that uses the organs of the lamb and of course the painted eggs. Keep in mind that many Romanians are religious, so they will go to church on Saturday evening to fetch the holy light for their homes and light candles in cemeteries, at their loves ones' graves. They would also respect the lent period, which ends on Saturday evening - perhaps one of the reasons the Easter lunch is usually a very rich one, after the 48 days of lent. This is the most restrictive fasting period in the Orthodox calendar.